Obsidian Entertainment isn’t afraid to try different things with Armored Warfare. 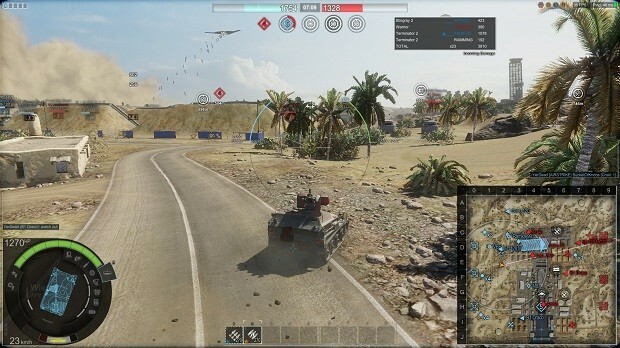 The game’s latest mode, Global Operations, hit the servers earlier this fall and offers a battle unlike anything seen before in tank-fighting games. There’s a lot going on, and it can be overwhelming at first, but it’s a spectacle that you should try to experience at least a few times, if only to admire all the effort that went into programming such an intricate and lushly rendered map. Global Ops matches are 15v15 contests requiring tanks of Tier 6 or higher. The objective is to reduce the enemy team’s score to zero or have the most points remaining in your team’s score when the 15-minute time limit is reached. You reduce the enemy’s score by destroying their tanks, destroying AI-controlled tanks, and by capturing/holding various objectives, which switch every five minutes, at the five- and 10-minute marks. There are also wildcard objectives you can capture, which don’t count toward scoring but can provide other in-game benefits to your team, such as ammo replenishment stations or aerial surveillance drones. While most of those elements could just be seen as additional “stuff” plopped into the game, there is one important difference between a Global Operations battle and normal PvP (or PvE) battle. In Global Operations your tank can respawn and return to the battlefield after you’re destroyed. It’s a necessary change to the formula, as it would be a shame to get into a match this large and then be knocked out in the first three minutes. The availability of respawns does introduce a different style of play, however. Maybe it was just me, but it felt like I was more willing to take risks than in a typical Armored Warfare match. I’m not sure if that led to me being more daring or just more sloppy and careless – such as the time when I sped around the corner in my AFV and wound up head-on with a MBT – but it definitely will change the way you think. Knowing that you can get back up after being knocked down will definitely alter your play style, for better or worse. Speaking of MBTs and AFVs, the bigger map – 40% larger than a typical AW map – and diverse objectives make movement even more crucial than ever. In my MBT, it seemed like it took me forever to get back into the action after a respawn, while my speedy AFV buzzed around the map like a hornet – admittedly, without doing much damage to enemy vehicles in the process. I didn’t see any artillery vehicles in the queue, so you won’t have to worry about those ruining your fun. What you might have to worry about, though, are the wildcards, which can produce some highly damaging effects. In my first battle, I wandered into a cluster of pillboxes, which fire guided missiles at enemies; they made short work of even my heavily armored MBT. In another match, I found myself right in the line of fire of an air strike, which blew me to bits. While the map does a good job of displaying these hazards, voice call-outs seemed notably absent. Some sort of “Air strike incoming!” similar to the artillery call-outs, or “Those bunkers are tearing us apart!” would help players new to the mode from feeling frustrated if they have no idea what’s about to hit them. While we’re on the topic of frustration, queues are as notoriously bad as ever. My shortest time for getting into a match was four minutes, and I thought that was well below average. Armored Warfare is a fun game, but having to wait five to 10 minutes just to get into a battle is enough to make you not even want to bother. I don’t know what the solution is to this dilemma, other than having more players or greatly widening the tiers of tanks in individual battles. It’s just an aggravation you’ll have to deal with. But if you can get into a match, then Global Operations offers something new and exciting to try out. 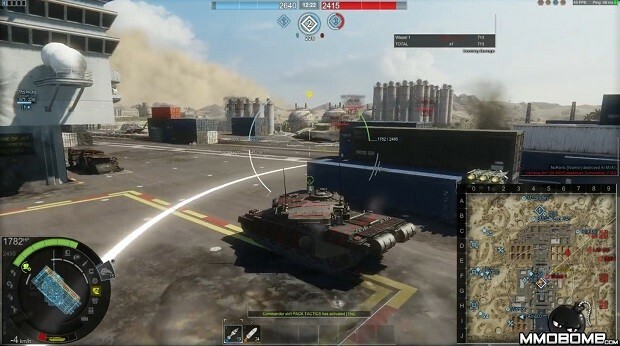 It’s not without room for improvement, and Obsidian does plan to expand the concept with new maps and different wildcards, but it’s a solid start toward what could be a new design paradigm for tank-combat games. For more on the game mode, head over to the Armored Warfare website.